PJ Development Holdings Bhd (PJD) aims to ride on the positive economic data by launching four projects worth about RM1.7 billion by third quarter of this year. Chief operating officer Lim Lian Seng said the projects are located in Sri Hartamas and Cheras in Kuala Lumpur, Butterworth in Penang, and Kuantan in Pahang. "There is a surge in demand for new residential, commercial and retail properties in those areas. We expect the products to sell fast under the current market conditions," Lim told Business Times. This would be the first round of major projects it is launching since 2009, he added. PJD had spent the last two years working on new plans after the economic crisis in 2008. "We incorporated new designs and elements as well as reduced the sizes for certain products in some of our approved projects to make them more affordable and appealing to buyers," he said. In the high-profile locale of Sri Hartamas, PJD will launch Duta Kingsbury, near the high-end commercial hubs of Mont'Kiara Solaris and Dutamas Solaris. Duta Kingsbury is one of few projects which PJD deferred after the crisis. The project was previously to feature some 200 condominiums of more than 3,000 sq ft and villas. Lim said it will now comprise more than 300 units of condominiums, ranging from 1,400 sq ft and priced above RM700,000. The villas have been scrapped. In Cheras, PJD will launch a mixed-integrated development consisting of three blocks of serviced apartments, two shop-office towers with entertainment areas, retail complexes and restaurants. Lim expects the project to be the new iconic landmark for Cheras. In Butterworth, PJD will launch phase four of its Harbour Place project, comprising over 300 units of serviced apartments with priced from RM300,000. In Sungai Karang, Kuantan, the company will launch over 200 units of seaside serviced apartments, close to the Swiss-Garden Resort & Spa Kuantan. Each unit will be priced from RM200,000. Astral Asia Bhd's units, Syarikat Ladang LKPP Sdn Bhd and Tasja Development Sdn Bhd, had signed a joint venture agreement to develop land in Pahang into a mixed property development. In a filing to Bursa Malaysia today, Astral said the 599.41-hectare leasehold project would comprise a commercial centre, an industrial centre, a mixed residential designs, public amenities and infrastructure. It said the proposed development was subjected to the shareholders' approval at an extraordinary general meeting to be convened. Astral said the project incorporated a high-tech park to be named -- Kuantan Hi-Tech Park. It said upon the implementation of the proposed joint venture, the business of Astral would be diversified to include property development. "The proposed joint venture and proposed diversification are expected to contribute positively to the earnings of Astral in the future financial years," it said. Astral is principally engaged in the cultivation of oil palm, civil engineering and construction works and property development. UOA unit UOA Development Bhd is the developer of mega projects such as the estimated RM6 billion Bangsar South in Kampung Kerinchi. KUALA LUMPUR: The board of United Overseas Australia Ltd (UOA), which is listed primarily on the Australian Stock Exchange (ASX), has submitted documents to Bursa Malaysia for a proposed listing of its development arm on the local bourse’s main market. 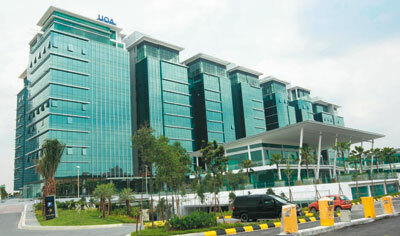 The Edge Financial Daily understands that UOA, which has a dual-listing on the Singapore Stock Exchange (SGX), is expecting to hear back from the local regulators soon and hopes to have its development arm listed on Bursa by June 2011. UOA Development Bhd, the developer of mega projects such as the estimated RM6 billion Bangsar South development in Kampung Kerinchi, is 100%-owned by UOA Holdings Sdn Bhd, which is in turn a wholly- owned subsidiary of UOA. It is worth noting that the UOA group listed UOA Real Estate Investment Trust (UOA REIT) on Bursa in 2005. In its recent filings with the ASX, UOA said it had on Jan 31, 2011 lodged a prospectus exposure draft with the Securities Commission of Malaysia for the latter’s “comment, approval for registration and distribution”. Earlier, the group in November 2010 made an announcement to both the ASX and SGX stating its intention to list its property development division on Bursa and in fact had undertaken a feasibility study to facilitate the listing. UOA’ shareholders have not met to weigh in on the proposed listing, although this would happen if and when the Malaysian capital market authorities give their approval, said a company official. According to filings with the ASX and SGX, UOA intended to maintain a majority stake in the listed entity with the initial public offering of at least 25% of the issued and paid-up capital of the development division. CIMB Investment Bank Bhd is the principal advisor for the proposed listing. UOA’s market capitalisation on the ASX was A$338.1 million (RM1.04 billion) as at Feb 8, that on the SGX was S$439.5 million (RM1.45 billion respectively. The share price of UOA on both exchanges are presently trading close to their 52-week highs of A$0.35 on Feb 4, 2011 and S$0.46 on Feb 8, 2011. For the financial year ended Dec 31, 2009, UOA posted a net profit of A$111.95 million on the back of revenue of A$152.18 million. According to UOA’s 2009 annual report, its single largest shareholder was Griyajaya Sdn Bhd with 276.36 million shares, representing a 30.05% stake, followed by Dream Legacy Sdn Bhd with a 12.17% stake and Metrowana Development Sdn Bhd with an 8.4% stake. UOA was incorporated in Western Australia in 1987 and was listed on the ASX in 1988. UOA’s associate company UOA REIT is listed in the Main Market of Bursa Malaysia, with assets valued at RM1.05 billion comprising six commercial properties in Kuala Lumpur with a total estimated lettable area of 1.5 million sq ft.